Scientists have discovered a new dinosaur that is similar to the Triceratops. Called Mercuriceratops gemini, the dinosaur would have weighed around 2 tons, which is about half the size of the well-known Triceratops. The Mercuriceratops had a bony frill on its head, with two wing-like protrusions coming out on either side, say paleontologists. Mercuriceratops got its name from the Roman god Mercury, who sported wings on the side of his helmet. The dinosaur was most likely an herbivore, and ate plants with a beak-like mouth. Paleontologists believe that it lived during the late Cretaceous period, which happened some 77 million years ago. That is the same period that dinosaurs like the Tyrannosaurus Rex and the duck bills lived in. The researchers used two different fossils fragments to come up with the new dinosaur. One piece came from Montana, the other came from Alberta, Canada. Although it can be difficult for paleontologists to know if a fossil belongs to a new species or a previously discovered one, they are certain that the fossils belong to the Mercuriceratops. For one, both have the exact same winged frills on their heads, making them distinct from previously discovered dinosaurs. Those frills were probably used to attract mates, the paleontologists say. Similar to the way male peacocks stand out because of their colorful and beautiful plumage, so too would a male Mercuriceratops stand out because of his colorful fin. “This animal is trying to trick itself out to attract mates, and it’s doing so in a very unusual way,” Ryan said. This could help scientists learn more about ceratopsians , or “winged faces,” and their evolutionary patterns. 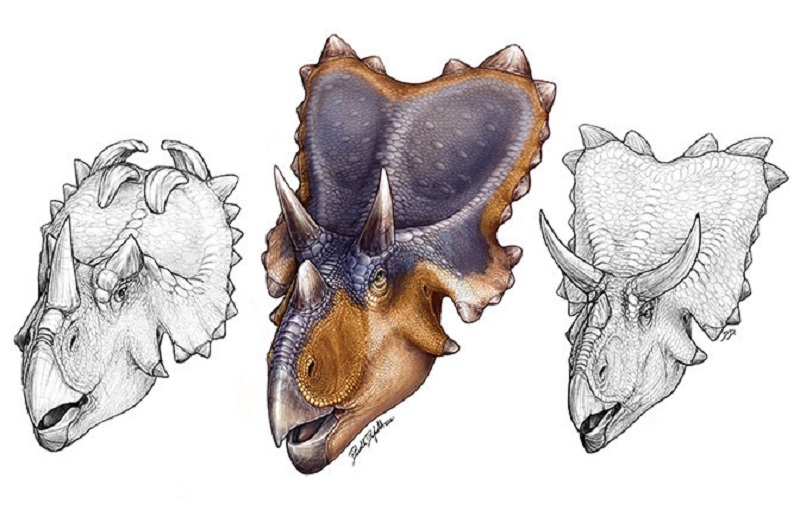 Ultimately, that could shed clues as to why the headgear for these different ceratopsians were so different and if that difference helped in the process of natural selection. The research was published in the journal Naturwissenschaften.